����For many years the Selma-to-Pensacola branch of the Louisville and Nashville Railroad ran only as far south of Selma as Pine Apple, and as far north of Pensacola as Repton. This left a gap between Pine Apple and Repton, and thereby hangs a tale. It was the building of the railroad to fill in this gap that brought into the being the town of Beatrice. 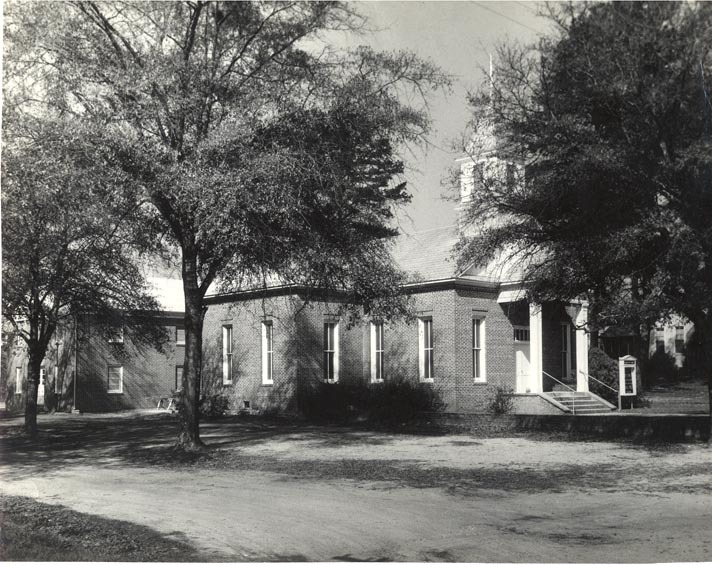 The general superintendent of this construction was a Col. Seymour of Nashville,Tennessee, with his son, Arnold, acting as resident superintendent. Messrs. Kehoe and Quigley were the contractors and the construction took place just at the turn of the twentieth century, 1899-1900. The Robbins and Harper families were already living in the vicinity. It is said the Bowery in New York City owed its crooked streets to the fact that it was built on a winding cow path. But, New York has nothing on Beatrice, for most of the town is in what was once the Robbins cow pasture. 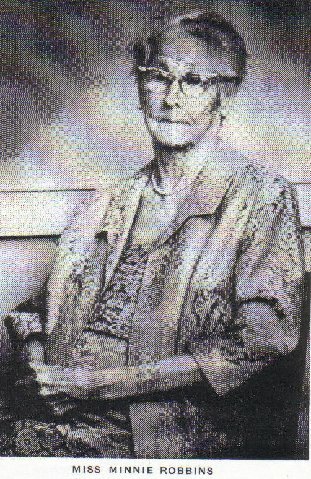 Mrs Barbara Robbins , widow of a Confederate soldier and mother of the beloved "Miss Minnie" gave the depot site as well as the right-of-way for the road, through her land, Then she sold the other land with the exception of five acres surrounding her home, which on the original blue print was called the "Robbins Reservation", and which for about a half of century was the Robbins Hotel, famed far and near for its old southern hospitality and delicious food. ����Mr. Quigley bought the land for a town, laid it off in lots and sold them. To celebrate the completion of the road and also to draw a crowd for the sale of lots, a big barbecue was staged. An immense crowd came from all the surrounding countryside, Also an excursion to points in Florida helped to celebrate the occasion, many passengers having their first ride on a train. ����There has been much discussion from time to time as to what the name of the new town should be. At last, the original plan of Col. Seymour to name it "Beatrice," prevailed. This was in honor of his granddaughter, Beatrice Seymour. The writer thinks this was a mistake because of not liking a girl's name for a town. By all means, the town should have been called "Robbins:,---a much more appropriate name. But let us say with Shakespeare, "What's in a name? A rose by any other name would smell just as sweet," and be content with the name as it is. In her distant travels the writer has often been teased about the name. "Where in the world is such a place a Be AT' rice?" People would asked joking about the pronunciation. But she always had a ready answer. "We know it's correct to pronounce it BE' a trice, but Be' AT a trice seems to suit the Beatricians better. Where is it? Why, that's easy,---down in God's Country----South � Alabama----and it has some of the finest people in the world there. I've heard it said that those who visit there always want to come back." Many of the families at Pineville built new homes and moved to Beatrice. Other families moved there to maintain the railroad, which did a thriving business of hauling cotton,lumber, and other products to distant markets and supplying merchants with fresh and up to date goods. Still others came to go into the sawmill business, which was and still is, an important industry. 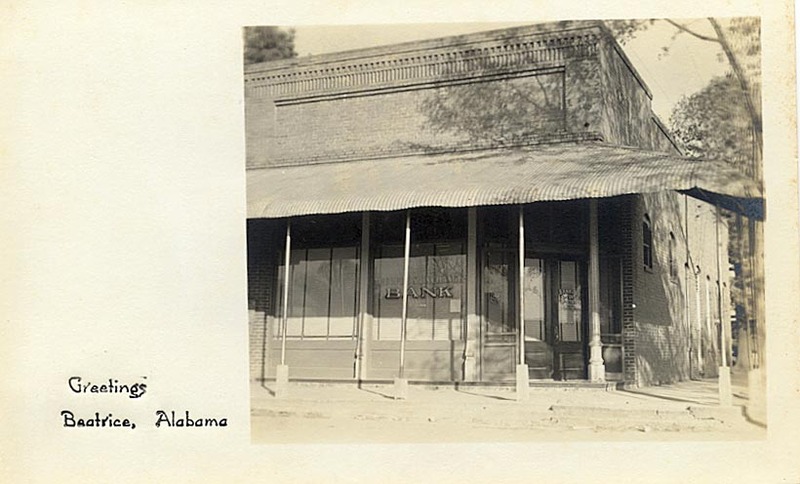 Most of the Pineville merchants built stores and moved their business to the new town. Mr. D.W. McPherson owned the first store to be operated in Beatrice. 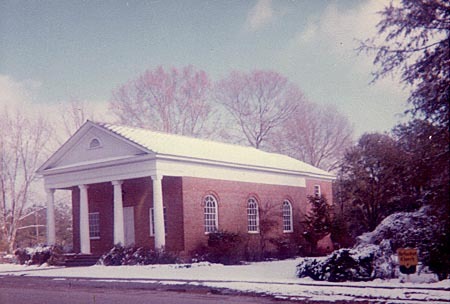 Methodist and Baptist were organized early. When a cyclone demolished the churches in the Pineville around 1910, they were never rebuilt, but after much deliberation, merged with those at Beatrice, and the well-kept cemeteries at those old churches are still used by the people of Beatrice. 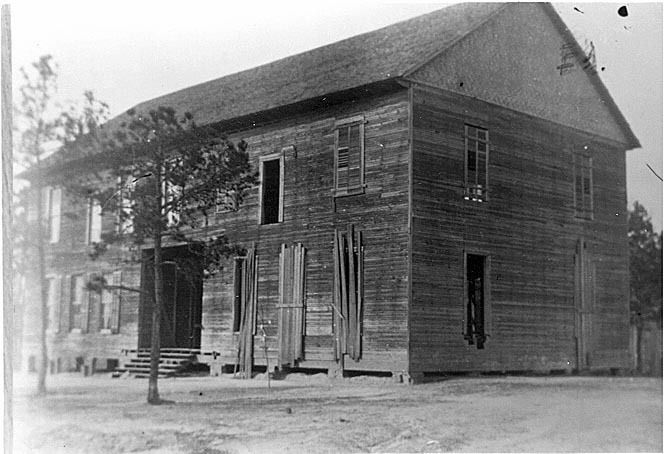 Today the Beatrice churches both have new buildings and nice homes for their ministers, and are doing fine work. The first school was called "Quigley Institute", a large rambling building which proved too large, and was later remodelled into a smaller one. 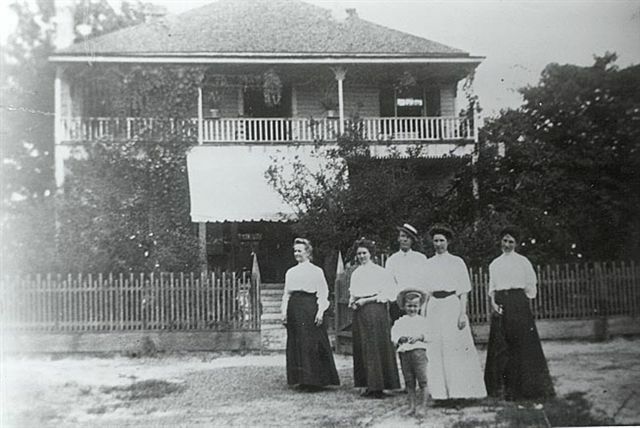 Professor Kilpatrick, Miss Mamie Boroughs, Miss Imogene Russell, Miss Mary Hope, Miss Nealie Nettles, and Miss Margaret Bolton were among the early teachers. Miss Russell, a native of Monroeville and an excellent teacher, came at a time when only one teacher was employed. One year sixty pupils in one room, but perfect order was maintained ! Today a large brick building houses a consolidated high school, with elementary school, home economics department, and a modern cafeteria. Pupils from the surrounding towns of Hybart, Vredenburgh, Natchez, Tunnel Springs, and others are brought to school each day by bus. . . Further emphasizing the traditional desire for education, many families have through sent there sons and daughters to the various in Alabama and other states. Consequently, many fine professors and teachers have gone out from this area to serve in the high and elementary schools, with some reaching the college status. During the 1920's, land between Beatrice and Pineville was bought by the Negroes who now have own community. Many modern homes are there as well as churches and stores. A large and up-to-date school is maintained. In 1907, The Peoples Exchange Bank was organized and is still going strong, serving a large area. Electricity came in the 1920's and homes were modernized for more convenient and enjoyable living; also street lights were installed. Street are now black-topped, sidewalks are paved, and hard-surfaced highways connect Beatrice with all sections, buses having replaced the discontinued passenger trains. All this is a far cry from the days of dirt roads, muddy and slick, and often dangerous in rainy weather. Today, due to a new lighting system, Beatrice ranks as one of the best lighted towns of its size. A fine water system is the boast of the town. The main "fly in the ointment" is the absence of a hotel. The once popular Robbins Hotel still stands, but is now owned by the Hunter's Club, and enjoyed by its members during the hunting seasons each year. And so,--- who can tell what greater changes and progress may come in this, the Space Age? The above article is written here just as it was published in 1966 with no changes. On Saturday October 27 2001, The Town of Beatrice celebrated it's 100th birthday, and what a party it was. Nothing was held back. A free Bar-B-Que lunch with all the trimmings was served to the guests. Activities included a Car Show, Games, Tours, and Story Telling. Music was provided by: "Southern Gentlemen Bluegrass Band, "Wisteria Washtub Band", "Gospel Believers Band" ,and Singers Lia Sager, Vikki English, Nikki English, and Allison Kelly. The History Recollection of Beatrice was given by T.N. Stallworth. Mr. Buddy Cater was the "Master of Ceremony", and kept things moving along. A Museum and History Room was set-up in the Fire House included over a 1000 pictures of the past posted on the walls. This is the Prayer for the Celebration written by Rose Marie Stallworth Clark. We would like recognize and thank the sponsors who made this event possible. Beatrice has come a long way in the first 100 years. The railroad and lot of the landmarks are gone. The spirit is still there along with the good wholesome life that makes it a fine place to raise a family. .... ..At Capt. Riley's funeral, to comply with his pre-expresses wish, his friends draped the casket with a Confederate flag.� He was buried near the site of the Flat Creek Baptist Church that he attended in his youth. "Once during the school year of 1891-92, our school in Buena Vista, a village in the northern part of the county, was visited by a stranger, leading a bear. He asked our teacher if he would like for the school children to see the bear put on a show. Our teacher paid him to have the bear act; he put a little boy's hat on the bear's head and the bear would stand on his hind legs and dance, then he would climb a tree." "After the performance, the man and bear started walking toward Natchez, a village six miles from Buena Vista. When they arrived, both man and bear were tired and hungry. Suddenly, the bear turned on his master, threw him to the ground, and started eating him alive. The bear refused to let anyone come near and the poor man was yelling, 'Stop, Jimbo, please stop Jimbo.' Mr. William Reaves, a citizen of Natchez, finally came with his rifle and killed the bear. The 'Bear Man,' as he was called, is buried in the Natchez Cemetery."